The proof is in the pudding! Read our testimonials. "I am extremely proud of our success over the past 12 years. That success is demonstrated through those who have used The Boat & RV Group. It has truly been my pleasure over the years helping buyers realize their dreams, and sellers find that 'right' buyer for the 'right' price." Below is a sampling of actual customer testimonials emailed to us. We include their contact information as well to demonstrate these are not "made up" testimonials. Although I waited several months before I used this superb service I without hesitation highly highly recommend using them. My trailer sold in less than two weeks. I was surprised and more than awe struck by the speediness of the fantastic results. Use them and you also will have the same results. Our 5th wheel was sold and was picked up by the buyers yesterday in Goodyear, AZ. Many thanX for your persistence. We have passed your info to our friends and the buyers as they have 5th wheels to sell as well. My coach was listed with Paul Sides at the Boat and RV Group for 60 days. I just recently sold it. I got a number of responses from the ad campaign. In addition any time I had question or addressed a concern to Paul, he was quick to respond to me with an answer or clarification. I would use his business again to sell my RV or boat. We finally sold our RV. Thanks for all the work you put forward in keeping my adds current. When asked, my buyer said that he found my RV via RVTrader.com. Please discontinue all adds and I again thank you for your service. I sold the trailer this weekend. Please mark all ads as sold. Don't know where to start these guys repond quickly to any request and place adds in countless website. Used them and they did what they say they will do. The Boat & RV Group was able to promote my RV on every website and sold within the time span he said he would. They were well worth the money I paid to get the news out there. Excepted offer on motorhome Please take down all adds. If I every have anyone that I know wanting to sell a RV I will definitely recommend your service. I have done business in the past and I understand business ethics as I did a lot of research before sending payment to proceed. I am very glad I chose The Boat & RV Group! PayPal helped to convince me also. Your, credentials helped and some of your wording in the news letter. Boat Rv Group did a great job of advertising my motorhome for sale and I was successful in a short period of time in selling for a good price. The Boat & RV Group is legit! Did exactly what they said and sold my RV. We advertised our motor home with The Boat & RV Group, it was not priced as low as some of the others like it but we were certain that if advertised correctly we would sell it quickly. Paul helped us along the way and was always available if we had questions (even after we paid). We sold our motor home to the first people that called us. If you put your ad in as many places as possible you will sell and that's what Paul did. I am sending this message to inform you that I have sold my 2003 surveyor and will no longer need your services. you have been a great help. thank you. Subject: Re: Your RVT.com Ad Expires in One Day! It was viewed 103 times. Upgrade Today - NEVER renew Again! Our RV sold last week for $40K. For your reference, the buyers saw the advertising from The Boat & RV Group. i want to take the time to thank you for all you help... we had you take care of the advertising of our 2004 Beaver motorhome....with in 3 weeks the coach was sold....many inquiries... this is differently the was so sell a motorhome... lots of coverage... i received call from all over the west coast where the mortohome was located...i would use your service again !!! 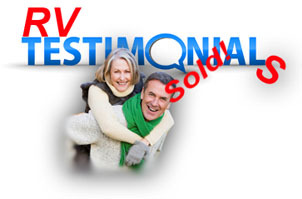 Thank you for your integrity and steady sound advice in helping me sell my RV. I now appreciate your realistic support and why you said “give it some time” Being in my own business and in sales I appreciated your approach and would recommend you to others. Paul, the camper just sold today. Thanks for all your help. Your service is second to none. Paul, I took a deposit on my rv, I appreciate your help, your service was the reason it sold!!!! Greetings Paul, I am sending this message to offer my thanks for listing my KZ Sportmans camper on the various sites thru your program. I have been lucky enough to sell the camper that I had listed. I order that any others would not think that my unit would still be available, I would like to ask that you will now remove my listing. Again, Thank you for all of the listings and of course I will not be needing to use the guarantee that you offered when I accepted the conditions of your listings. I appreciated the assistance that I received during the listing that you provided. Very pleased with these guys. They sold my boat in about a month. The other site I was with had it for one year, with only one legitimate response. The Boat and RV Group came through big time. I would wholeheartedly recommend these guys first. Very professional and organized. If you want to sell your boat fast advertise with these guys. You can even email me at mikey.lowe@att.net if you still don't believe. Well, it looks like your service works! After advertising for almost a year by ourselves with not a lot of attention we sold the boat within a month using your system. I wanted to inform you so you can amend the listings. Paul, I guess the price reduction helped...the Four Winns boat sold today. Please remove it from all online listings. Thanks for all of your help with both boats! Glad they are both sold!!! Subject: Cobia 19 Bay SOLD!! Just wanted to let you know that my Cobia 19 Bay sold over the weekend so my for sale campaign can be discontinued. It took less than a week! Couldn't have came at a better time & I'm thankful. Pricing it right and using your system led to quick results. Was well worth it to me. Thanks again. Please remove my add the boat sold a few weeks ago. Your service worked and was worth the cost. Paul and the team at The Boat and RV Group stayed on top of our camper posting. They responded to questions in a timely manner and were very professional. We will be sure to contact them again when it is time to sell our boat. Thanks for the help in selling our boat. After placing our ad it took less than 2 months to get it sold. I was highly satisfied with your service. Thank you for the lead. The boat sold yesterday. I appreciate your help. Please remove my name from your marketing campaign and thank you again for helping me place this beautiful motoryacht with a new family. The sale did come from a lead through the ad. I found it very helpful to get notice of interested parties from your site. Thank you for your help in selling my boat! Thank you for all you did. The number of calls I received was amazing and the extent of advertising great!!! I placed an ad several months ago which generated several leads and we successfully sold our boat as a result. We were very satisfied and I highly recommend their services. I wanted to follow-up and report the boat is sold and the people will be picking it up this afternoon. Thank you so much for helping with this I could not have done this without your aid. I am quite impressed with your service, our boat sold thank you! This boat was sold last July, thank you for excellent service! I want to thank you for listing my boat, IT HAS SOLD! Having mixed emotions, Sellers remorse, but you did what you said you were gonna do and I thank you. This website is great. Best value for advertising your boat anywhere. Sold my boat quick. I have already refered two of my friends to use this site.